The Lennex collection by Feiss is a throwback to the Industrial Revolution, featuring open metal cages, exposed lamping and gooseneck detailing that resemble true vintage warehouse fixtures. Real gas piping secures the pitted, rugged sand-cast shades, which are produced in a new Slated Grey Metal finish. Designers are selecting this industrial look to complement a wide array of décor from traditional spaces to urban loft to chic, European-inspired eclectic rooms. 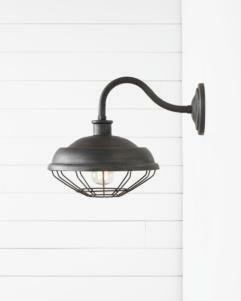 The indoor/outdoor wall sconces are a sharp architectural accent whether flanking a front door, garage or pool house. The industrial-inspired Lennex collection offers a three-light chandelier, two-light island chandelier, three-light island chandelier, six-light island chandelier, one-light mini-pendant, a medium one-light indoor/outdoor wall lantern, and a large one-light indoor/outdoor wall lantern. Both one-light wall lanterns are designed to be used indoors or out and are Wet Rated for outdoor use.